A photo gallery as soldiers from a regiment based at Catterick Garrison in North Yorks conduct the final Afghan medal presentation parade. Staff Sergeant Kate Lord has been recognised by the Queen for her work changing views about women among the young men she mentored in Kabul. Military Medics from the world-famous military field hospital in Afghanistan will parade through York today, 22nd November 2014 for a homecoming and medals parade. Over 200 medics from 65 units in all three Armed Forces will attend a Thanksgiving Service in York Minster. Following the service, the military medics will parade on Duncombe Place where 80 Operational Service medals will be presented by Director General of the Army Medical Services, Major General Jeremy Rowan OBE QHS and the Lord Mayor of York, Councillor Ian Gillies. 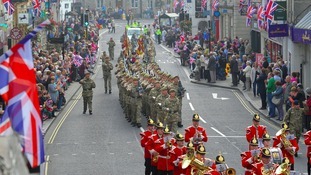 Led by the Band of the Royal Armoured Corps, the parade will march down Parliament Street and return via Coney Street where the salute will be taken by Major General Rowan accompanied by the Lord Mayor of York on the steps of the Mansion House. As military operations come to an end, your tributes have poured in for the 41 soldiers from our region who died in Afghanistan. Remembering the men who lost their lives in the conflict. Families in the North East are relieved after the end of combat operations in Afghanistan, according to the soldiers' charity the Royal British Legion. 41 soldiers form the region have lost their lives in Afghanistan. Keith Laws, the Chairman of the Royal British Legion's Northumbria branch, told ITV News Tyne Tees: "I think it will be a great relief not just to the service families and the dependents but to us all that our soldiers and our service personnel are not in harm's way in Afghanistan anymore." The 39 Regiment, based at Albemarle Barracks in Northumberland, is due to disband early next year as part of an Army shake-up. A coroner has criticised the Ministry of Defence for a series of failures over the deaths of two soldiers, including one from County Durham, in a fire which engulfed their tent as they slept at Camp Bastion in Afghanistan. Wiltshire and Swindon Coroner David Ridley said he would be making a "preventing further deaths" report over the case of Privates Rob Wood, 28, and Dean Hutchinson, 23, of Spennymoor. Mr Ridley recorded a narrative conclusion and listed eight areas where there was either a "systemic failure" or "failure" in the circumstances that led to the men's deaths. The two soldiers, who served with the Royal Logistic Corps, were killed when fire swept through a logistical centre at Camp Bastion in Helmand on February 14 2011. There were delays in alerting the military fire brigade because soldiers at the scene did not know the emergency 222 number. The "unwritten rule" for the troop was that the duty non-commissioned officer should have remained awake while the other soldiers slept.